"How in the world is that still an issue? It has been months since that injury!" This is a common response when one of my staff discovers an area of tenderness and sensitivity that a client assumed was no longer an issue. How indeed does something linger in the background for so long, only to be revealed when one of the BWA staff thoroughly explores the area? There are some reasonable explanations for this based on the current understanding of muscle function. (Current understanding because what we know is always changing based on the research in the field.) The most plausible explanation is that when the muscle is first injured, it increases its electrical activity and is often noticeably painful. Once the initial insult quiets down, there is still remains an increase in activity and sensitivity. This increased activity is no longer perceived as a threat by the nervous system because the intensity does not change over time. The nervous system relegates it to the background since there are far more pressing issues to attend to. But, just like in a computer, running programs in the background still takes energy and "bandwidth". When one of my staff finds such an area, the brain is now reminded again of the injury. In essence, our hands stimulate the brain to reassess the area. Our hands ask the question, "Did you know about that? Do you still want to keep it?" The brain then reassesses the area based on current, rather than historical information. As you have probably experienced, the result is often a decrease in pain and an increase in function. This also explains why clients report an increase in energy and well-being a day or so after a session. With less energy being funneled to areas of restriction, there is more available energy to allot to the demands of daily life! I had just returned from the Massage Therapy Research Foundation conference in Boston; a marvelous event with many excellent presentations about current massage therapy research. One moment during a talk by my friend Dr. Jeanette Ezzo was particularly poignant. Dr. Ezzo was doing some research that involved giving subjects who had received a series of massage therapy sessions an exit survey. I don’t actually remember what the point of the survey was, but one subject, after taking the survey, turned to Dr. Ezzo and said, “But you didn’t ask me about what the massage means to me.” She went on to describe how the powerful role her massage therapy sessions had in her life. I’d like to tell you what she said, but my mind drifted immediately to about 1982, when I first opened BodyWork Associates in Champaign. One of my regular clients (and I had precious few back then) was a wonderful older woman who came to see me at the same time every week. She had no particular musculoskeletal issue; she just came for relaxation and renewal. We never spoke very much, and never about personal things. I knew few details about her life; but her presence radiated wisdom and caring. After her death some years later, one of her friends remarked to me how important her massages with me were. When my response was a bit dismissive, this person filled me in on the rest of the story. My client’s husband suffered from what we now know to be Alzheimer’s. My client spent 24/7 taking care of her husband, except for the one hour she spent at my office. That is why she so valued the time on my treatment table. As Alzheimer’s was little understood in those days, she told hardly anyone, which meant she also had essentially no help. What was sacrosanct to her was getting someone to watch her husband to she could come to her massage therapy sessions. There is an adage that the meaning of a communication is the response received. One never knows how powerful what we say or do can be to another. A warm smile to a stranger, a kind word to a server or a patron; what seems inconsequential to the giver may be quite powerful to the recipient. I will always be thankful that I was able to provide a weekly respite in her very difficult task. And, despite all her struggles, she always found time to encourage me to continue offering massage therapy to Champaign-Urbana, even when the phone hardly ever rang. The impact of those kind words gave me strength and certainly played a role in having BodyWork Associates here many years later. I doubt she knew how powerful her words of encouragement were for me or how many people her kindness would ultimately affect. I'm Having Pain. When Should I Consider Scheduling a Session at BWA? In the last newsletter, we dealt with when to schedule a follow-up appointment. What if you haven't been in for a while and are now having discomfort? There are no hard and fast rules about the decision to seek treatment, but here are some guidelines. At BWA, we tend to take a very pragmatic approach. The experience of discomfort can come and go, sometimes for what seems to be no attributable reason. It is wise to move as much as possible without aggravating the area. If the discomfort moves around each day, that generally has a better outcome. If the pain and discomfort continue for more than four days in the same area or is reproducible with specific movements, then it is wise to schedule a session with us. Plan on at least two sessions to address that area. What happens if I do nothing? The research data about this isn't very promising, for at least two reasons. First, your body will adapt around the pain, changing the way you move. Perhaps our greatest strength as humans is our ability to adapt, but every strength has a shadow side. We can background the discomfort, making the pain part of a new "normal". Additionally, the research shows that the movement compensation you employed remains after the pain is healed. What your brain needs is a "software update"! That is part of the effect of our Precision Neuromuscular Therapy approach. Other research data shows that an injury can physically reduce the size and strength of a muscle, as measured with a special MRI technique. Doing nothing resulted in a 3% return after one month. Specific treatment and movement resulted in a return to within .25% of the original size! Clearly, time does not heal all! One of the most important aspects of a muscle problem is the ability to mimic much more serious conditions. There are many examples of this, from trigger points that resemble migraines to muscles around the knee that create pain easily mistaken for internal joint derangement. Specific neuromuscular therapy of the offending soft-tissue is often amazingly effective and can save enormous amounts of time, money and aggravation. One muscle has a particularly nasty ability to resemble cardiac symptoms; the sufferer feels a sharp pain during full inhalation- a very unpleasant knife-like pain in the back. I'd imagine many people have visited the ER, thinking they are having heart issues, only to be told their heart is fine. The problem is, they still cannot take a deep breath! Precise treatment of this muscle can completely eliminate symptoms, generally, three short sessions are all that is needed. What a difference unrestricted breathing can make! Our job at BWA is to be soft-tissue problem-solvers in addition to providing massage therapy for relaxation and stress reduction. We appreciate the ability to serve you in this way. That was a question from one of my clients last week. Pressing on a point in his shoulder, he felt it shoot up to the back of his head, which is where his headaches originate. Wondering how that works is certainly a fair question, but one that is much more complicated than most people realize. There are two levels to this, the "what" and the "how". On the "what" side, a trigger point is an area of hyper-sensitive tissue that refers sensation elsewhere. You may have noticed this when on the table. Pressing on a sensitive spot in one area produces (or replicates) an achiness or discomfort somewhere else. In the research world, these sensations can be replicated by injection of a tissue irritant, such as hypertonic saline. Moreover, 4 out of 5 people will get the same referral. The "why" question is far more difficult and ultimately, not known. These referral patterns do not follow a nerve pathway, a typical muscle pattern, or any other obvious explanation. This lack of explanation drives some people nuts! I get it, but as a clinician, I accept that I cannot explain everything. In fact, the mechanism by which anesthesia works is not known, yet hospitals use it every day. Why? Because it works and results matter. Many of you have been the recipient of trigger point work at the office and you know how effective it can be. It is not uncommon for symptoms to disappear for years after successful treatment. You have probably also experienced how hyper-precise the work is; close does not count. The actual tissue disruption is 3mm by 3mm, about the size of a grain of rice. This is not easy to locate- it takes excellent palpation skills on the part of the therapist. This is also why more general approaches-even injections by a physician, can fail. Skill and attention to detail matters. There is a You Tube video that has a nice explanation for trigger points. You may find it useful. Trigger points are just one aspect of the total approach to soft-tissue therapy that we at BWA employ. They are not the answer to every question, but can be an important source of frustrating muscular pain and discomfort. One of my clients was complaining about her neck the other day. 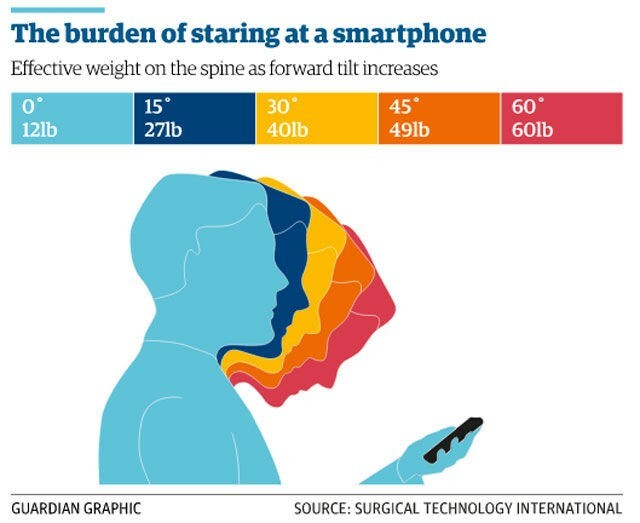 As she described, after staring at her phone for an extended time, "My neck speaks!. Why does that hurt so much?" she asked. In a study about two years ago, researchers looked at the burden on the neck when bent forward for extended periods. The chart below shows the results. A 45 degree forward head is the equivalent of a 49-pound weight on the neck muscles. Adding to the burden is that muscles, when held in a constant contraction, endure a constantly decreasing blood supply. This can lead to headaches, as the muscles involved are well known to refer pain to the back of the head. What is the solution? There are times when you need to look down but, if possible, minimize the length of time you hold your neck in that position. As often as you can, sit up straight and look at the ceiling. Giving your neck frequent breaks and moving it as much as possible will do wonders for the musculature of your neck. In addition, seek out someone with training in hands-on treatments (such as Precision Neuromuscular Therapy) to target exactly the muscles most involved in this condition. In addition, all of the BWA clinic staff has extensive training in hands-on treatments (Precision Neuromuscular Therapy) to target exactly the muscles most involved in this condition. Low back pain affects almost 80% of the population at some point in their life. The economic cost of back pain is significant, estimated at almost 90 Billion dollars annually. The reality is that low back back is multi-factorial. There are multiple influences- there is no one size fits all solutions. For the staff at BodyWork Associates, we try to take the most reasoned approach possible based on an evidence informed approach. By evidence informed, we mean that we base what we do on both our years of clinical experience and also what the research literature tells us. There is abundant evidence that our targeted massage therapy (Precision Neuromuscular Therapy) is very helpful for back pain. There are three categories that are common applications. Pain. Our approach is much more than general massage; we are trying to access very small areas of tissue injury that are instrumental in the experience of pain. As the client, you may have had a very real experience of this on the table. As we slowly and carefully explore the muscles of your back, you might have the feeling we are close to something, but not quite there. Hopefully, with your feedback, we might shift our pressure millimeters in one direction or another to land on a spot that your nervous system knows is at the epicenter of your pain. Your feedback in this process is essential for us to be on target! Research literature shows these areas of tissue injury to be as small as 3 millimeters. Fatigue. When muscles are injured, they reach their threshold of capacity sooner. In this case, your back feels tired after walking a significant distance or standing over a work surface. Targeted therapy will increase the time of your activity level before you reach the threshold of fatigue. Weakness. This isn't talked about as much, but weakness in a muscle will show up far before pain is experienced. Muscles have one job and that is to contract. If injured, they do that one job less well. Our targeted therapy helps muscles to regain their capacity to contract (strength). Interestingly, if your weakness is due to muscle injury, exercise is likely to make the problem worse, not better. Exercise is by nature overloading a muscle; overloading an injured muscle will only exacerbate symptoms. In the best case scenario, our work will make exercise possible, ensuring a full recovery. Speaking of exercise, I met Dr. Stuart McGill when I was working for the Chicago Bulls in the late 1990's. There are very few people who know more about back pain than Dr. McGill. I found a wonderful little article about him with some very simple exercise approaches. You might find this helpful if you have back pain. Activity levels in Norway seem incredibly high and built into the culture. As a result, Norway is rated the healthiest country in the world. Yes, diet plays a role, but I think activity is the major player in their good health. In this newsletter, I'd like to explore massage therapy and movement from a couple different perspectives. It is well known that for many conditions, controlled and graded movement is far better than total rest. When I first started practicing, bed rest was a common prescription for back pain. No informed health provider makes that recommendation now. The research data supports the idea that the more you move, the better. It is however, hard to move when you hurt. If your therapist at BodyWork Associates can alleviate your discomfort to the point where movement is possible, very good results are likely. This is perhaps one of the greatest benefits of our targeted Precision Neuromuscular Therapy. As someone deeply involved in the research, I have seen many studies that show that massage therapy is more effective when combined with other approaches as well- often those approaches are pain management and/or movement related. We at BodyWork Associates are big proponents of the active recovery approach. If one of the UI athletes is injured, almost never is complete rest assigned by the trainers. 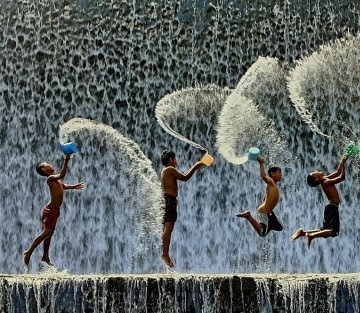 These kids are back on the playing field in record time and it is not because they are playing hurt. Their activities are scaled back, but never completely ceased. Why? One necessary component of healing is blood flow. Muscle contraction is natures way of increasing blood flow to an area. If your low back hurts and you spend days resting in bed, your blood flow to the low back is severely compromised. A simple activity like walking can jump start your recovery. Place your hands on your back and start walking. Do you feel your back muscles contracting? They engage (at low levels) with every step you take. Step forward with your left foot and feel the muscles on the right side of your back contract. Putting weight on the right foot engages the left side of the back. Walking then is a great way to increase blood flow to the muscles of the spine. Even more interesting is research into the pressure on the discs of your lower back. Intra-disc pressure goes down with increased walking speed. Conversely, the slower you walk, the greater the disc pressure in your lumbar spine. Pick up the speed and you will feel better. On a side note, one very interesting recent research study showed that deep massage increased blood flow to the muscles and and increased tissue temperature greater than that produced by ultrasound! It is highly likely that during your session, your BWA therapist will incorporate some stretches and movements. This concept is vital to success in the work. Treating a muscle alone isn't enough- it has to be shown that greater comfortable range is now possible. If not, the nervous system still constrains movement based on old information. It acts as though there is still a problem. In fact, research shows that if you have a problem and you compensate, the compensatory movements stay even when the problem disappears. Our specific approach, Precision Neuromuscular Therapy, is like a software update for your nervous system. We strongly encourage our clients to move after a session, especially if you have come in with something specific. When we interact with your muscles, it is highly likely that they are more pliable and you are more body-aware than before your session. Without strain, choose an activity that also is exploratory. If you are a golfer, go to the driving range and practice your short game. Take that ballroom dance lesson, that Tai Chi or yoga class. Join your spouse for a walk in the woods or around the neighborhood. You will feel better for having done so. There has been an abundance of evidence that our propensity to sit for long periods is devastating to our health. Since the average person is now sitting for 9-10 hours a day, our life has changed drastically from my grandparents who farmed the land. In a new study published this week in the Annals of Medicine, greater time sitting leads to a lesser life span. Read a nice summary of the research here. In our staff educational training seminars this month, the focus has been on helping knee and foot pain issues. While our work with neck, shoulder, and lower back discomfort is well known, issues of the lower extremity get much less attention but are no less crucial. The premise of the work is the same as for many of the other conditions we address: Muscular problems can often mimic or display the same symptoms as much more serious issues. Pain on the inside of the knee could easily be assumed to be an injury to the internal ligaments of the knee. As in every other part of the body, the brain will always protect deeper structures with muscular protection; muscles with take the brunt of the trauma first, protecting deeper and more sensitive structures. As a result, the muscles are often a source of pain when the ligaments are uninjured. What about arthritic changes in the knee? Can targeted massage be helpful even in cases like that? To answer this question, researchers at the University of Miami Medical School did a study on 24 people with arthritic knee pain. The results? Treating the quadricep and hamstring muscles were essential to achieving good outcomes. Survey scores revealed that participants receiving massage had less pain, greater activity, and less sleep disturbances. Countless people with knee issues have benefited from our targeted Precision Neuromuscular Massage. Realistically, you may want to budget for about three half hour sessions with a focus on the knee. The odds are very good that our Precision Neuromuscular Therapy can help. In addition to our therapy, strengthening and stretching the quads and hamstrings are essential. I have been asked this question more often than I could ever count. Two concepts are embedded in this question. First, I want to address "this" kind of work. For many years, BWA was in a position of defining what massage therapy was to Champaign-Urbana. As massage has become more popular, many other massage practitioners have appeared on the scene. Many clients have also received massages on a cruise or a vacation. Often these sessions are pleasant, but our clients tell us that general massage is not at all in the same league as what we do at BWA. This is because our work is rooted in Precision Neuromuscular Therapy (PNMT), work that is very targeted and focused and grounded in results. Massage in a spa setting is great, but has a completely different purpose than PNMT. The second part of the question refers to allowing "nature" to take its course. What does happen when aches and pains are left untreated? Aches and pain become internalized as ‘normal’ by the nervous system. Over time, the problem area slowly gets worse, largely unnoticed by the host. At some point, crisis happens and drastic measures are needed. These measures are often expensive and somewhat dangerous, but often the only resort left. Practitioners of these drastic measures exclaim that only their methods are effective against such maladies, which is true if the process is allowed to escalate to such a degree. This does not address the possibility that the whole mess could have been averted by proactive measures. How does this happen? Why is it so common? The real problem here is chronology. As the ancient Chinese philosopher said, “He who solves a problem before it surfaces, who calls that clever?” Why is there such a tendency to wait until crisis happens? While I have talked about this issue for years in my classes, mentioned it to countless clients and colleagues, I did not really get it until a few weeks ago listening to someone describe a scenario with a lily pond. Strangely, I marvel at how what we think we know suddenly reaches a new understanding, understanding that is visceral as well as cognitive. In the lily pond story, imagine a five-acre pond with a lily or two in one corner. Of course, lilies are pretty and decorative and a couple in your pond is OK. The problem is they grow prolifically. (In this instance, the lilies double every day and fill the pond in one month.) Where there was one, there are now two, two then four, four then eight. The owner of the pond is still unmoved; eight lily pads in the pond is hardly a big deal. Since the owner of the pond hardly pays attention, the lily pads go unnoticed. Only when the pond is seemingly suddenly overtaken by lily pads and the owner realizes there is a problem, does the owner call for a service to eliminate the lily pads. The problem is, at day 29 with the pond half full with lily pads, the lily pads are one day away from taking over the pond completely. If the pond service is delayed at all, it will be too late. If they arrive immediately, the actions taken are severe and expensive. The owner is resentful that the service was so expensive and they killed other vegetation and fish in the process. He/she would probably not recommend them to anyone else because it was too expensive and they were a bit careless. Is this fair? When we wait until day twenty-nine, not much good happens. Actions taken are drastic and painful. The problem is that all the motivation for intervention is at day twenty-nine, not at day ten. Perhaps we must do a better job of teaching our clients to address the underlying causes before they become big problems. You can bet that the pond owner doesn’t need to be reminded to keep the lily pad population under control. We learn to change our furnace filters, get our teeth cleaned, and change the oil in our cars every 3000 miles or so. The time to address the soft-tissue problems with massage therapy at BWA is before there is a painful crisis. Massage Therapy is certainly not as effective during a crisis as more drastic measures. Does this mean that manual therapy is not as effective as other strategies? Clearly that is not what should be surmised. Real wisdom is not how to deal with crisis. Real wisdom is avoiding crisis. If we did this the cost (in both dollars and suffering) would be reduced substantially. While I was in between clients the other day, a woman came into the office looking at our Temper-Pedic cervical pillows. Hearing more about her needs, it was clear that she was looking at a new pillow because her neck hurt. Inquiring how long her neck had been hurting, she informed me that it had hurt for almost three months. A few days after a low-impact car accident, her neck began to hurt. When I asked her about what she had done in response, she replied that time heals all and her neck would surely improve eventually. How much time is reasonable? Two months? Five months? After a certain point this strategy doesn’t seem very logical. Life tends to constantly remind us that ignoring a problem seldom makes it go away. Clearly however, there are physical issues that do dissipate with a little time. What is a reasonable criterion to know the difference? One possibility is trajectory. If you have a muscular issue, it is not uncommon for it to last for two to three days. After day four, is the pain getting less or staying about the same? Is this discomfort affecting daily life? If each day the condition continues to improve, it is likely to disappear on its own. This can be a bit tricky to perceive as your nervous system can habituate to the pain, that is why noticing if the discomfort affects your daily life is sometimes more accurate than just measuring the intensity of pain. If the discomfort isn’t improving significantly each day, consider getting some targeted Precision Neuromuscular Therapy to change the course of events. The goal of our massage therapy is to speed up the process, helping you to recover as quickly as possible. What does recover mean exactly? This is a fair question, given some recent research data. As you are aware, when your body is in pain, you use yourself differently. Muscles alter their function and often go into protective tightness. What makes sense is that when the pain is no longer there, the muscles return to regularly scheduled programming. This is a nice idea, but not born out in the research data. Muscles seem to continue their altered function even when this is no longer needed. This can lead to a different set of problems down the road. Having our targeted approach to massage therapy is like pressing reset (or the refresh button) on an electrical system. It causes the system to reassess the state of affairs based on current, rather than historical data. That can be a powerful tool to redirect the system back to more optimal functioning. The aftermath of muscular exertion is often a few days of aching pain called Delayed Onset Muscle Soreness or DOMS. While soreness after a significant exertion is somewhat of a given, there are things you can do to lessen the effect. The most important factor in preventing and treating DOMS is increasing circulation to the area. (People used to think this was due to lactic acid build-up, a misconception that has lasted for decades). Here are two strategies you can use at home. 1. The best way to increase circulation is muscular contraction. If possible, move using a gentle form of exercise. If you are sore from a very long bike ride, go for a nice walk the next morning. Your muscles may initially complain, but will relent if you keep the activity at a low level. 2. Use contrast therapy. Apply moist heat for two minutes and then cold for thirty seconds. Alternate four to five times. The temperature differential is what helps and this is far more efficient than long stretches of cold or heat. Research has shown that short sessions are better at dealing with DOMS than longer sessions. This is the strategy we use with U of I athletes. If you know that you are going to do something strenuous, schedule a half hour session the next day. Also, on occasion, deeper massage work can create post-massage soreness. The best way to prevent this from occurring is to move after a session, rather than rest. If you had deep work on your calf and thigh, go for a short walk afterward. It really helps prevent post-massage soreness. I just applied this myself, as I did a 100 mile bike ride a week ago. The next day, I had one of my staff do a short massage therapy session and I made sure to go for two walks with my wife. After the second day, the soreness was not noticeable. When we have discomfort, the over-riding impulse is to identify exactly what hurts. Actually, the "what" question is much easier that the "why" question. Here are two examples of when the actual cause isn't what we feel at the time. Imagine that you have multiple tender areas in the muscles of the neck. What you might guess is that you have neck tension, but nothing seems to help. Although you may not put them together, my staff might ask you about any tension in the muscles of the jaw you might not have noticed. Why? Problems in the muscles of the jaw often increase the tension level of the muscles of the neck, which then presents as neck discomfort. In one research study, subjects with advanced arthritis of the jaw were given an injection to anesthetize the joint. Where one would expect the relief to occur is in the area immediately surrounding the joint. In fact, where the greatest relief occurred is in the muscles of the neck! 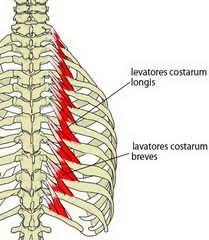 Pain in the low back is far more common than pain in the thoracic spine (mid-back). There is however, a good deal of evidence that restriction in the thoracic spine can lead to pain in the low back. Here's why. The low back is built for stability, not mobility. Rotation of the whole low back is less than ten degrees! The thoracic spine is ideally suited to rotate to more than fifty degrees. If your thoracic rotation is restricted and you are trying to create rotation, such as to swing a golf club or tennis racket, you will try to accomplish that action by rotating your low back instead. This will result in low back pain, but all the treatment of the back will ultimately fail. What the mid-back cannot do, the low back tries to accomplish. This is not going to go well! Strangely, symptoms are not always felt in the problem source such as the low back or jaw, only in the area that overworks to compensate. The staff at BWA is very mindful of these relationships and wants to address not only the symptom, but the possible cause. We have see quite a few clients lately who have presented with pain in the knee that has been attributed to arthritic changes. Our results have been quite good, and the research supports this. There's been more than one study suggesting massage therapy helps relieve the pain associated with osteoarthritis of the knee. More recently, the results have again been affirmed by research supported by the National Center for Complementary and Alternative Medicine. This 2012 study comprised 125 adult participants diagnosed with osteoarthritis of the knee. At eight weeks, there was significant improvement (measured by an arthritis index score called WOMAC) in the 60-minute massage groups compared to usual care and the massage group reported less pain. The lead researcher stated, "The three highest doses of massage improved relative to baseline in WOMAC pain at 16 and 24 weeks, in stiffness at 24 weeks, and functionality at 16 and 24 weeks." The results seemed to last. Why Don't You Have a Large Menu of Services? I was on the phone the other day with a company that wanted to help promote BodyWork Associates online. One of their big features was that as we change service menus, it would automatically be updated on their site. As politely as possible, I declined. This company was very used to dealing with spa centers, where there is often an extensive list of services available, often each with a long description. Change two or three aspects to the protocol and Voilà, you have a whole new menu item to market. From a business perspective, I get it. From a personal perspective, I haven’t the least bit of interest. At BodyWork Associates, our menu revolves around you. At the beginning of your session, one of my staff will sit down with you to inquire what your goals are for the session. Even if you have been in previously, your goals for that particular day might be completely different. Plus; you have the right to change your mind! It is very common for a client to state that they want a general session, only to discover as one of my staff examines his/her neck and shoulder area, that the session would be better spent dealing with only that. The opposite also happens where fifteen minutes of concentrated work creates a resolution that is then followed by forty five minutes of general work. You get to choose. In a way, a menu is- “I have an answer and I hope it matches your question.” For us, our desire is to match your needs with what we do, not the other way around. It isn’t flashy, but I think it is one of the reasons we’ve been here since 1982. Thank you for supporting us in that endeavor. This April, I celebrated my 38th anniversary of practicing massage therapy, a milestone that I never expected to accomplish. Looking back over this period, it is very clear that my career, and the nature of the work itself, has changed dramatically over the years. Part of the reason I am thinking about my career is that one of my clients asked me this question- Knowing what I know now, would I still have chosen this path? In the past, the answer was a quick “yes”. This time, I thought about his inquiry for a few moments before answering in the affirmative. His question caused me to both look backward to the past and also reassess what is important now with regard to the mission and the function of my chosen path. It is only natural and appropriate that time and experience has reshaped the fabric of my work. The result of such a long career is evolving clarity about the mission of this work, where it fits in the larger picture, and why that is important. Looking back on those very early years, I was completely enamored with the novelty of massage therapy; it felt as though I was a pioneer down a new and important path. Years later, as I discovered neuromuscular therapy, it felt like a new chapter in my massage career had unfolded. The work required far more anatomical and technical skill than general massage and I was inspired by the challenge and the possibility of massage as a corrective and truly therapeutic modality. During that time, it is also with a bit of embarrassment that I recall my overzealous assessment of the value of massage therapy in the treatment of musculoskeletal pain. There is an effect in psychology called the Dunning-Krueger Effect; the people who know the least are the most confident. That was certainly true for me during this time; I was unaware of that which I did not know. As I dove ever deeper into the science of the work in the mid 1990’s, I became more and more deeply aware of the endless mysteries associated with this (and any field) of knowledge. The more I learned, the less sure I was about that which I had never previously questioned. At the same time, a different kind of confidence began to emerge. Every client I saw became a learning experience. Research endeavors that had unexpected outcomes took me down previously unknown routes of exploration. Instead of being devastated and demoralized by research failures, I was rediscovering the same wonder for massage therapy that I had in the very beginning of my career. That sense of wonder continues to the present moment. As many of you know, I don’t typically see people for general massage therapy for relaxation these days. Not because massage for relaxation isn’t valuable in its own right, but because I can best serve others by using my skills to solve very difficult problems. This is the interesting part with regard to my practice; as my skills have elevated, the complexity of the conditions I see has also increased. Each day is filled with deep challenges and complicated cases that push the limits of my ability. Part of the reason that I share this background with you is that even though my career and type of massage I do has changed tremendously over the years, the mission, far clearer today, is still the same as it was in 1977. Hands-on therapy such as massage can play a vital role in health care. Far too many people suffer from musculoskeletal pain thinking that nothing can be done to help them or that the pain they experience is somehow “normal”. The development of Precision Neuromuscular Therapy (PNMT), the work that I teach, is based on effectiveness and efficiency. As I travel and speak at conferences across the country, I have heard many presentations from researchers, health care providers, and educators from our top health care institutions and places like the National Institutes for Health. The picture they paint isn’t pretty; the data on the effectiveness and efficiency of standard approaches isn’t just underwhelming- it is a high cost that all of us are paying. This trend is not sustainable; we just cannot afford to waste money on approaches that don’t yield real benefits. As technology increases, the costs have gone up substantially. If the outcomes increased in proportion to the cost, then this increase may be justified. In fact however, our outcomes aren’t better at all. Only the cost has increased. In 2011, we Americans spent 13 Billion dollars on spinal fusions alone. The annual cost of back pain is estimated to be in the neighborhood of 90 Billion dollars! Is there a way that massage therapy, specifically Precision Neuromuscular Therapy, can fill gaps in the system and save both individuals and our health care system valuable resources? This questions consumes my thoughts these days and demands that we clarify exactly what we are best at, especially targeting conditions that are not well served by traditional approaches. My goal for BWA is to keep better outcome data to help us know exactly that; did what we do work and how we can tweak it to be even more effective. A condition like TMJ (jaw pain) is a prime example of how we can be effective and efficient and save both the individual and the health care system substantial amounts of money and aggravation. Typically, with just three sessions, our success rate with pain in the jaw is very high. The total cost of these three sessions is a tiny fraction of what other more invasive approaches can cost. The science is also clear- more invasive approaches to TMJ pain are very expensive and do not produce favorable outcomes. My goal is to have a whole set of areas with which we are clear that we can help. On the flip side, it will also be clear that there are some conditions in which we have little to offer, therefore should refer to other disciplines who are more effective. We should know what we are good at, and what we are not. More than ever, I believe that there is a place for our specific form of massage therapy called Precision Neuromuscular Therapy. While we have lots to do in the future, our track record with many common muscular ailments is one of effectiveness and minimal cost. Our commitment as an office is to continue to improve and refine our approaches to maximize results. You, our clients, deserve nothing less. It Must Be Arthritis. . . It is a comment that I hear quite often; "At my age, my pain is probably due to arthritis." While this is possible, it is by no means a given. Arthritis may be the source of most of your pain or perhaps the soft tissue surrounding the joint may be largely the culprit. I Exercised Once. . . The other day, I had a client ask me a perplexing question. He had referred a friend to BWA, who saw Eric for a one hour session. The person had been having sciatic pain down the leg for three months and no one had been able to help him previously. In a last ditch attempt, he decided to try coming to see us after speaking with my client. After the session with Eric, the client was now free from pain for seven days, the first pain relief he had for three months. After a week of no pain, the deep ache down the leg slowly returned. My client was asking if there was someone else his friend should see or another treatment available. What I find very sad about this question is the idea that you can have pain for months and yet expect one session to "fix" it. Oh if it were only true. So much in life is about building momentum, more process than event. I tried exercising once and didn't lose any weight. . . I took a lesson on the violin and still couldn't play Bach. . . I ate healthy once and didn't feel any better. . .
We at BWA are very sensitive to possible time and monetary issues with regard to appointments. We don't ask you to come for a long series of sessions or make you sign a yearly contract. At the same time, it is important to understand that if you are coming in for a specific problem, a series of three to four sessions is probably in order. In that way, whatever gains we make will not be lost over time. Plus, it can take a session or two to localize the real problem, which isn't always apparent in the beginning. When and how often should you return? The ideal is that if you experience a lessening of symptoms after your session, you should return before the symptoms resume in earnest or re-escalate. In our former example, the person should have come back after about five days. The third session should probably have been about 7-10 days after the second session. In all probability, that should have solved the issue. All things considered, especially compared to the cost of other interventions in terms of time and money, our Precision Neuromuscular Therapy is very efficient. As with so many things it isn't just what, but how often and for how long. Working together, we can make progress and problem solve through the many variables on the way to better muscular health.